14 more photos below. . . Here's some freshly baked inspiration for your holiday table from the Farmgirl Fare recipe archives—and they all freeze beautifully. Just click on each name to go to the recipe. These scrumptious Savory Chive and Sharp Cheddar Cheese Scones are a springtime variation of my Savory Cheese and Scallion Scones, which is one of my most sought after recipes. Made with softened cream cheese in place of the butter, both versions mix up quickly and always garner rave reviews. I've been baking them for 20 years and love them split in half and toasted with butter or made into cream cheese and ham or turkey sandwiches. Four more homemade breads below. 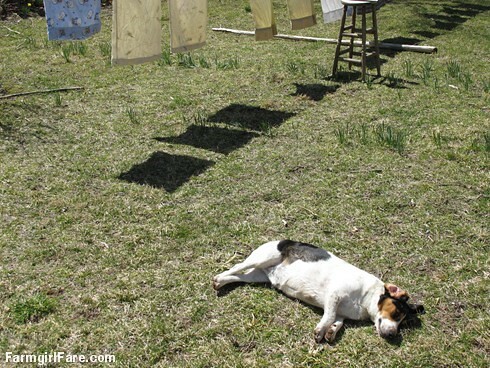 . .
Tuesday Dose of Cute: Hello, Spring. Hello, Creek! Hello, spring. You're looking a little pale this year. In the past five days we've had more snow than we had all winter. The biggest snowstorm of the year arrived late on the second day of spring, with big, soppy flakes that piled up to about five inches in no time. By the time I made it outside the next day with my camera (we're both down with the flu now) most of it had already melted, but it was so pretty while it lasted. 11 more photos and an update below (hover over each image for a description). 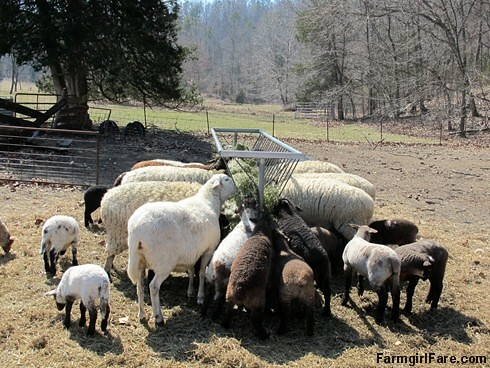 . .
All you can eat hay buffet—kids under 40 pounds eat free! If you're wondering what these BlogHer reviews are and why I write a few of them each year, please see my long replies in the comment section of this post. And thanks for supporting the advertisers who help bring you Farmgirl Fare! When my publishing network, BlogHer, asked if I was interested in being part of a review program for Glad food storage containers, saying yes was a no-brainer since I already use them. I'm a big believer in storing food (and all sorts of other things) in reusable containers, and we have them in lots of shapes and sizes. Since we both work at home on the farm we don't need to pack a lunch every day, but we never head into town without plenty of edible provisions. Even if we're just making the 20-mile round trip to the post office we take along water and snacks, because when you live out in the middle of nowhere anything might happen between here and there. More story and photos, plus a fun Pinterest contest below. . . 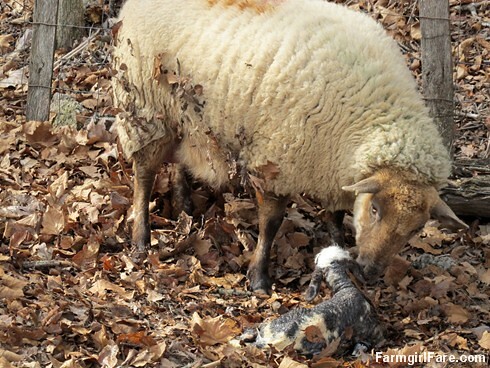 Two-year-old Helga and her newborn ram lamb (photos taken February 9th). So how do you distinguish yourself from the flock when you're not the first mother of the season, you don't have triplets, and by the time it is your turn to give birth, twins are already old news? 17 more photos and an update below. . .
Spanning two seasons: a hot bowl of comforting soup, garnished with a sprinkling of easy to grow spring chives from the kitchen garden (soup recipe here). The temperatures here on the farm have been going up and down lately, which is par for the course in late winter Missouri. It dipped down into the low 20's (F) two nights ago and is supposed to be up in the 70's by Saturday. 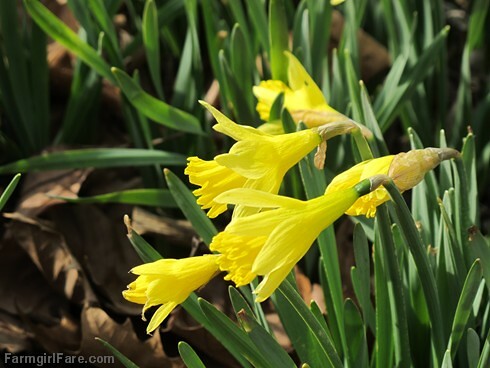 The daffodils along the fence all burst into bloom the other day and then froze. 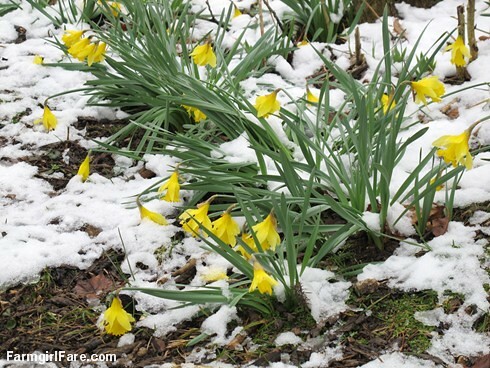 Thankfully these cheerful flowers are also very hardy. I'm hoping cozy soup season will hold on at least a little longer, though, because I've been craving this easy Roasted Onion, Potato, and Cabbage Soup. 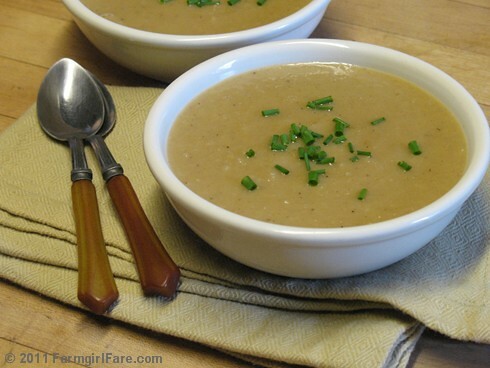 Inspired by my favorite Roasted Leek and Potato Soup with Arugula, it's thick, rich, and flavorful, yet low fat and full of healthy goodness. The roasted potatoes, onions, garlic, and cabbage also make for a tasty side dish on their own—perfect for St. Patrick's Day. Enjoy! 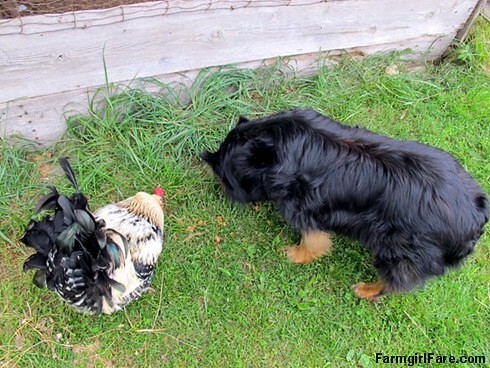 © FarmgirlFare.com, slowly slurping our way towards spring. I'm Doing Another 30 Days of Yoga: Care To Join Me? Spring! What better time to let a new home yoga practice bloom? Last May I announced that I was getting ready to do Marianne Elliott's 30 Days of Yoga and wondered if any of you wanted to join me. Several of you did, and it ended up being a really great experience. In fact, taking Marianne's course changed my life—and I never made it more than 15 minutes into my 45-minute yoga video (and that's okay!). Have you been wanting to try yoga, or wishing you could get back into a regular yoga practice? 30 Days of Yoga is a lovingly crafted online course to help you develop and sustain a home yoga practice that adds self-care, kindness, and a greater sense of well-being to your daily life. Marianne is an author, yoga teacher, courage cultivator, human rights advocate and consultant, as well as a former human rights lawyer in New Zealand and a United Nations peacekeeper in Afghanistan. She created 30 Days of Yoga for herself because she struggled with her own home yoga practice. There are three different 30 Days of Yoga courses to choose from: the standard version (which I'll be doing), one for total beginners, and one for people who think they're too busy to do yoga. (There's also a course designed especially for curvy bodies. The next curvy yoga course will start on April 15th, and registration will begin on April 1st.) The standard version lets you choose from several different yoga practices to suit your needs and goals. 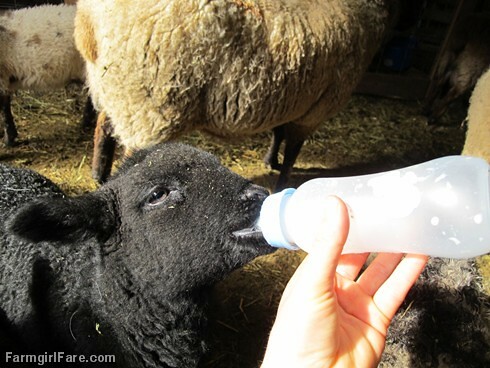 Feeding one of my two bottle lambs in the barn. Random photos taken around the farm yesterday. It rained for several hours (yay!) and when the sun burst out during a lull, I took a break from cleaning up the greenhouse and grabbed my camera. 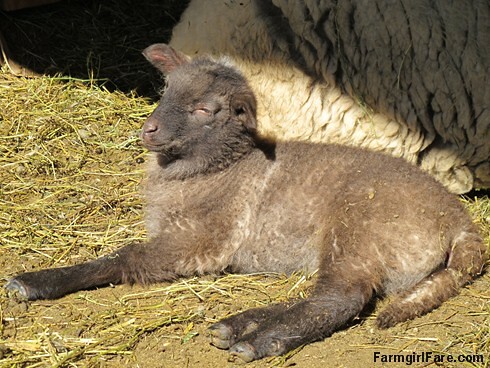 Our 19 little lambs are growing fast, and hopefully the grass in the fields will soon be too. Seven more photos below. Hover over each image for a description. . .
© FarmgirlFare.com, soft and snuggly all the way. 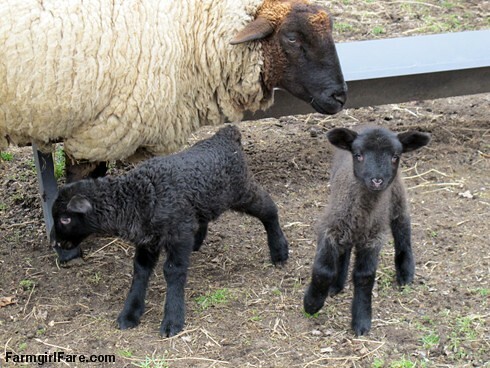 More photos and a lamb report below. . .